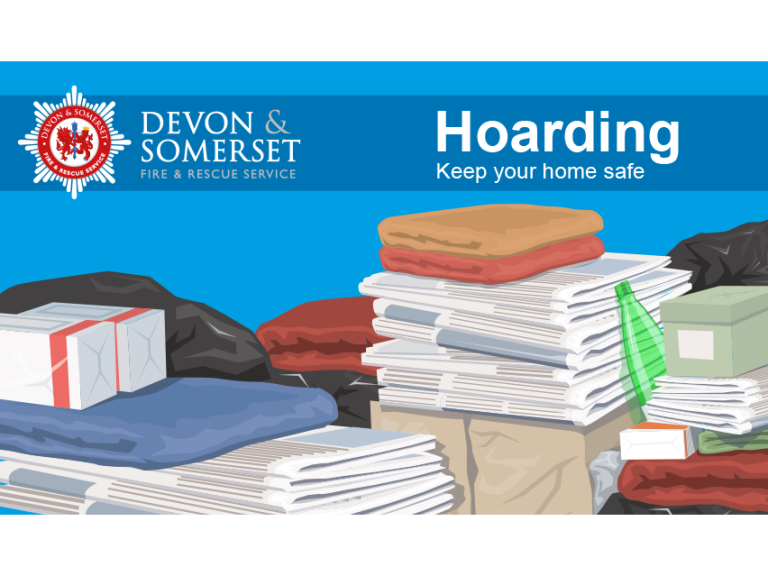 It’s Hoarding Awareness week which seems an opportune time to highlight the work Devon & Somerset Fire & Rescue Service Safeguarding Team have been undertaking to support individuals with hoarding behaviours. Hoarding and poor housekeeping has been identified as one of the seven risk factors that make someone more likely to die in a fire. High levels of combustible materials mean that a fire is more likely to spread, escape routes are severely compromised and piles of belongings can become unstable and present trip hazards. The Safeguarding Team have been linking with partner organisations to look at ways in which individuals who display hoarding behaviours can be supported. By reducing the amount of belongings and items in their property to create a safer and a more habitable environment. The team have been working particularly successfully with Devon and Cornwall Housing who have identified tenants with hoarding behaviours. Working closely with Housing sustainment officers and de-cluttering organisations has proved successful with a number of interventions. As the work progresses effective working arrangements with key partner organisations are developed that create the opportunity to explore new and innovate ways to engage with and support individuals who display this particularly complex behaviour. Associated difficulties such as depression and anxiety, post-traumatic stress disorder can complicate matters and if an individual is not able to access their bathroom or use their kitchen, then self-neglect can begin to present. Earlier this week, the Safeguarding Team represented Devon & Somerset Fire & Rescue Service at Hoarding UK’s first national conference, ‘Improving Person Centred Outcomes’. They will also be working closely with Hoarding UK over the future months on an exciting 2 year plan. Hoarding UK is the only UK – wide charity solely dedicated to supporting people affected by hoarding behaviours. So look out for further updates coming soon! Hoarding poses a high risk to operational fire fighters when attending the scene in the event of an incident. Thought about making the call to request free Home Safety advice? The majority of fires we attend in properties resulting in injuries or fatalities involve vulnerable people. Our visits are designed not only to promote general safety but well-being within our communities.